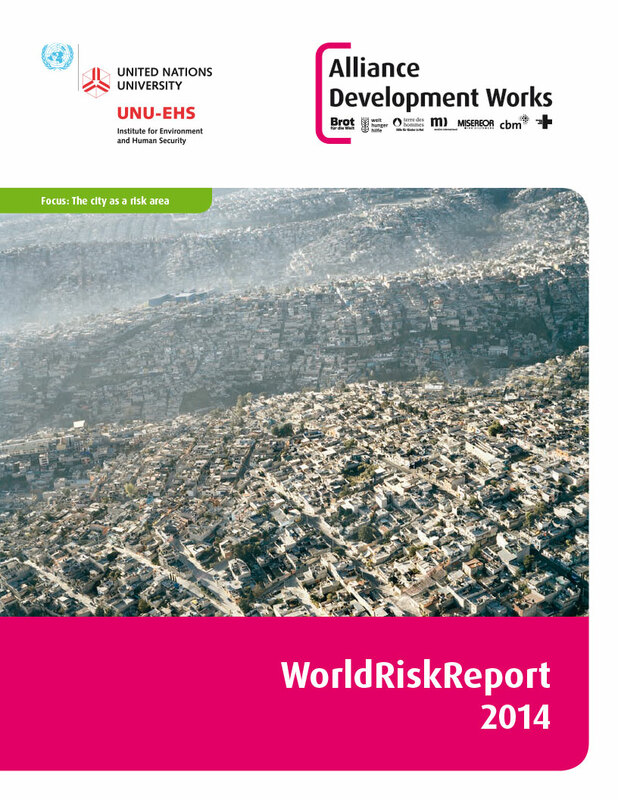 Every year millions of people worldwide suffer from disasters in the aftermath of extreme natural events. But whether it be earthquakes, cyclones or floods, the risk of a natural event turning into a disaster only partly depends on the force of the natural event itself. 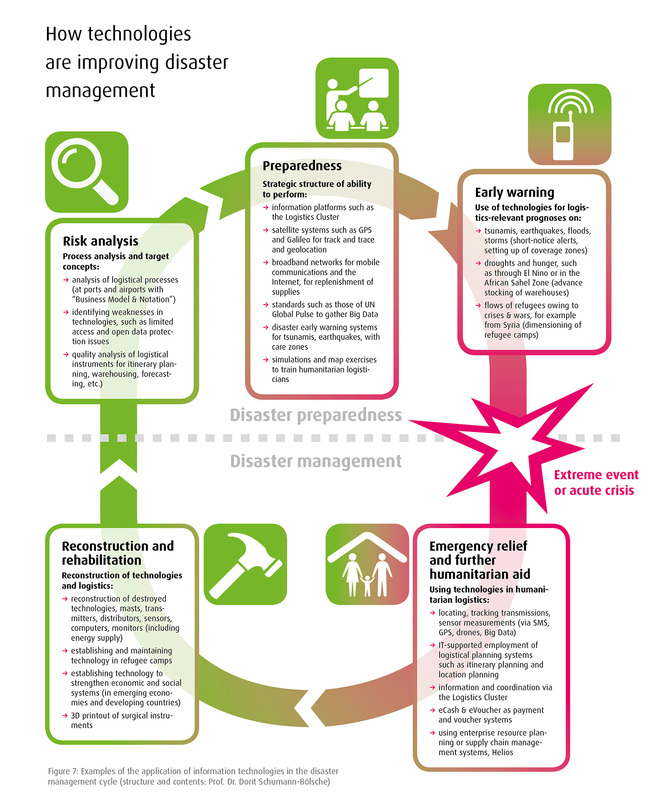 The framework conditions of a society and the structures in place to respond quickly and to provide assistance in the event of emergency are just as significant. 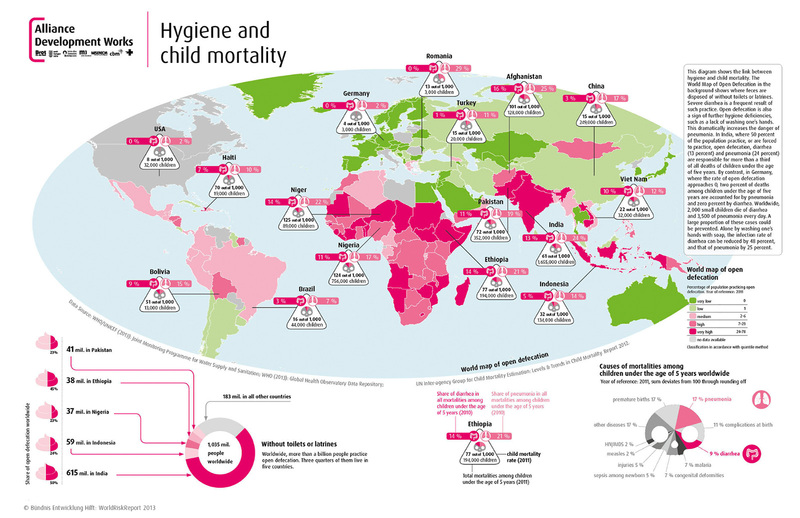 The more fragile the infrastructure network, the greater the extent of extreme poverty and inequality and the worse the access to the public health system, the more susceptible a society is to natural events. 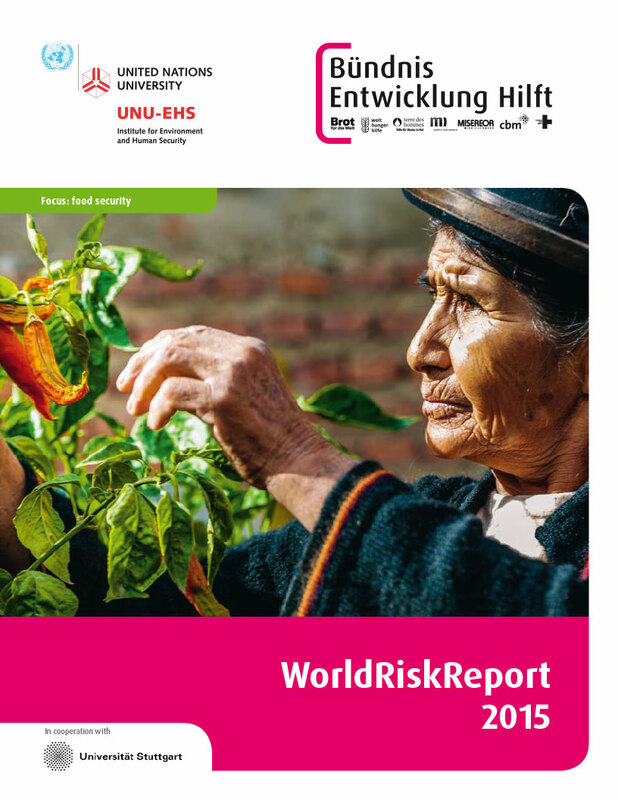 Extreme natural events cannot be prevented directly, but countries can reduce disaster risk by fighting poverty and hunger, strengthening education and health, and taking preparedness measures. Those who build earthquake-proof buildings, install and use early warning systems and invest in climate and environmental protection, are better prepared against extreme natural events. The annual editions focus on a main topic and include the WorldRiskIndex. In 2018, the report was published for the first time in cooperation with the Institute for International Law of Peace and Armed Conflict (IFHV) of the Ruhr-University Bochum. 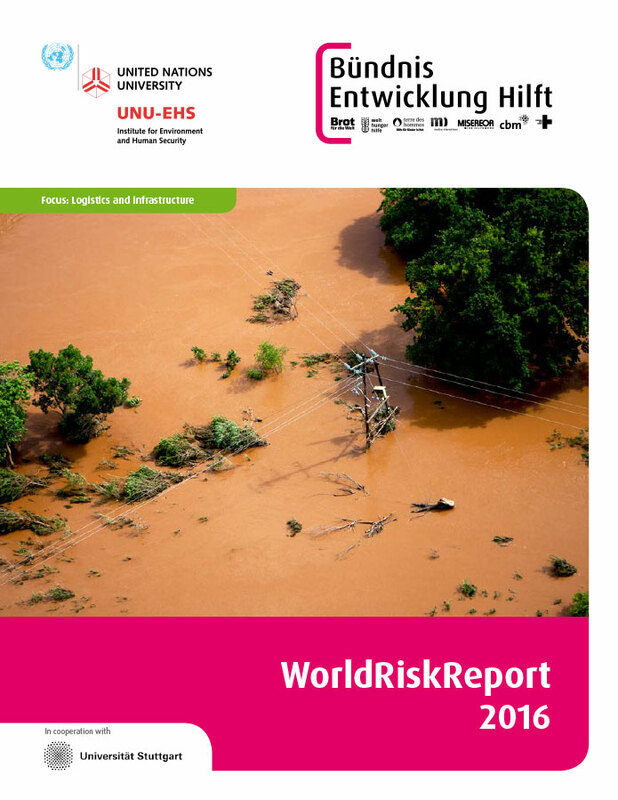 The WorldRiskReport should contribute to look at the links between natural events, climate change, development and preparedness at a global level and to draw future-oriented conclusions regarding relief measures, policies and reporting. 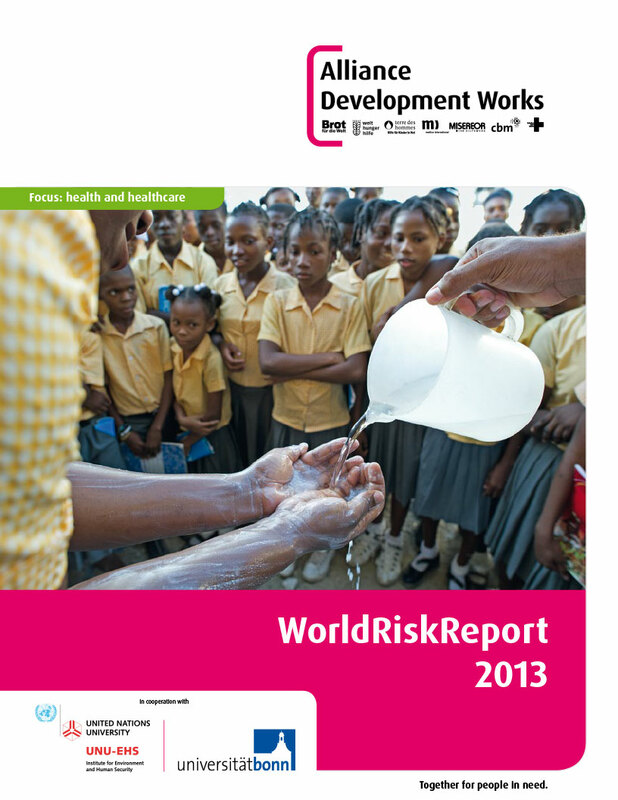 About one out of every four children worldwide lives in an area affected by disasters. 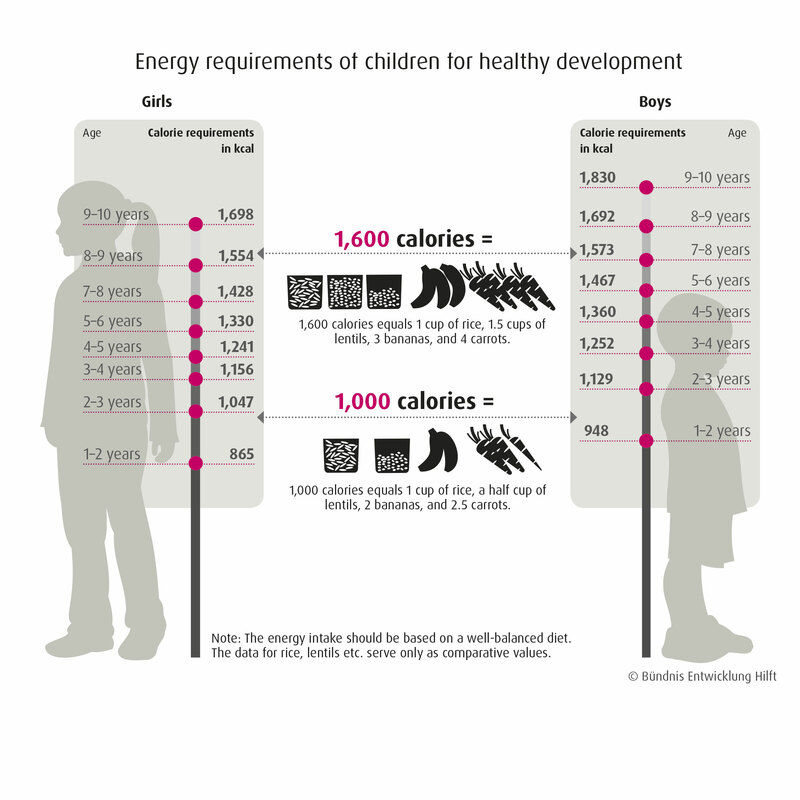 In this context, children are particularly vulnerable. This is mainly because they are physically inferior, can take less mental strain and their coping strategies are not as developed as those of adults. 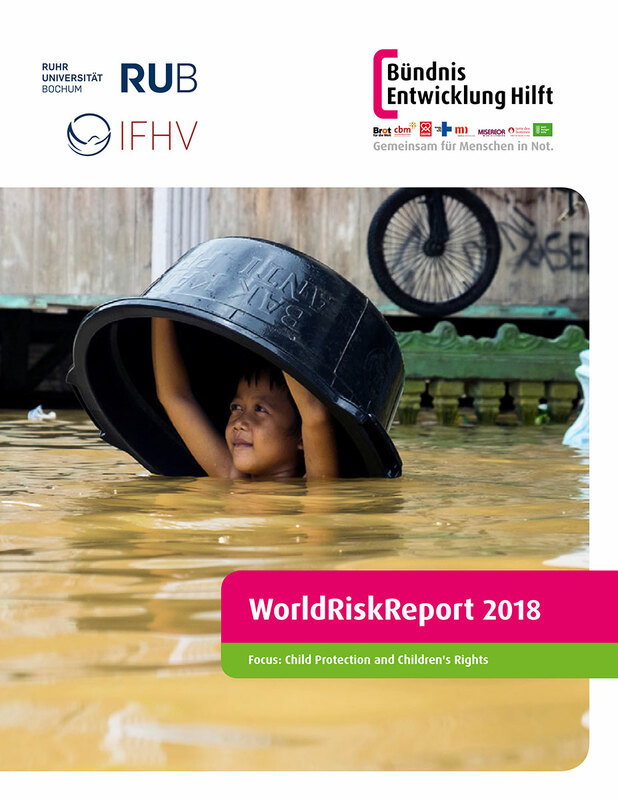 In addition, their rights are often not recognized and implemented during and after disasters, even though they have been guaranteed these rights through the ratification of the Convention on the Rights of the Child. Therefore, a prime objective of humanitarian missions is to ensure the survival and protection of children and counter long-term negative effects of the disaster. Child protection centers, offering children food, protection, as well as health and mental care, are one of the most important instruments. 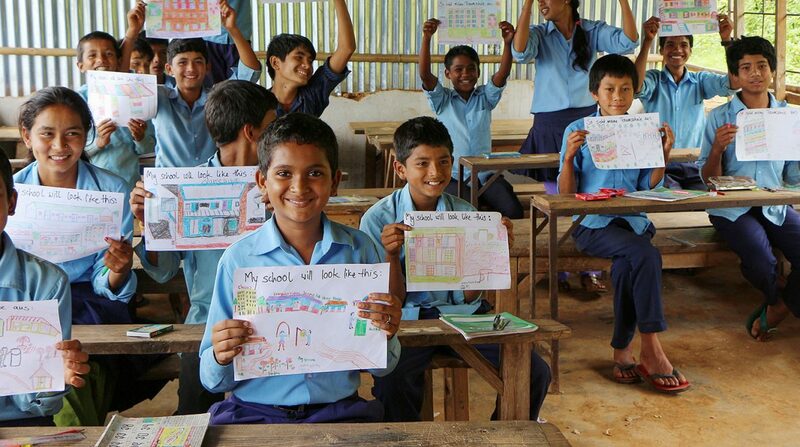 In the aftermath of a disaster, children should be reintegrated into a functional public school system as quickly as possible. 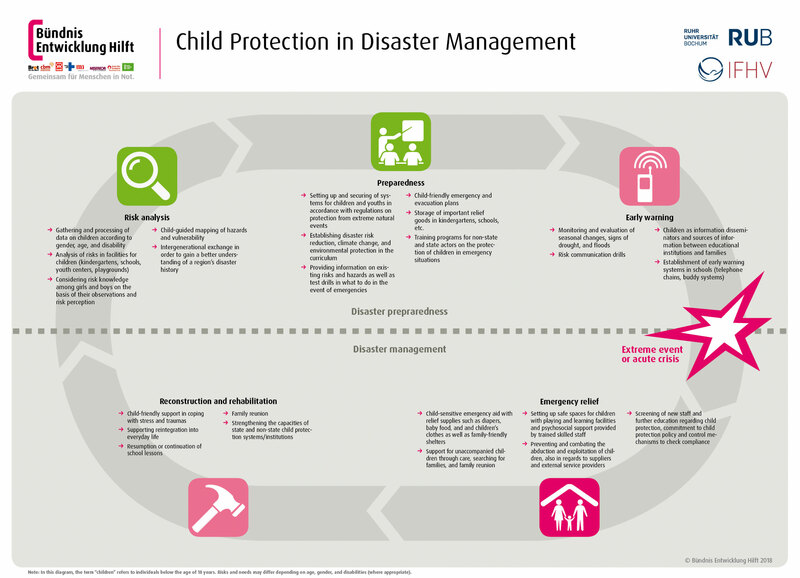 Disaster preparedness have to address the need of children as an especially vulnerable group. In addition, children should be actively involved and help shaping strategies and action plans as they perceive and identify other risks. 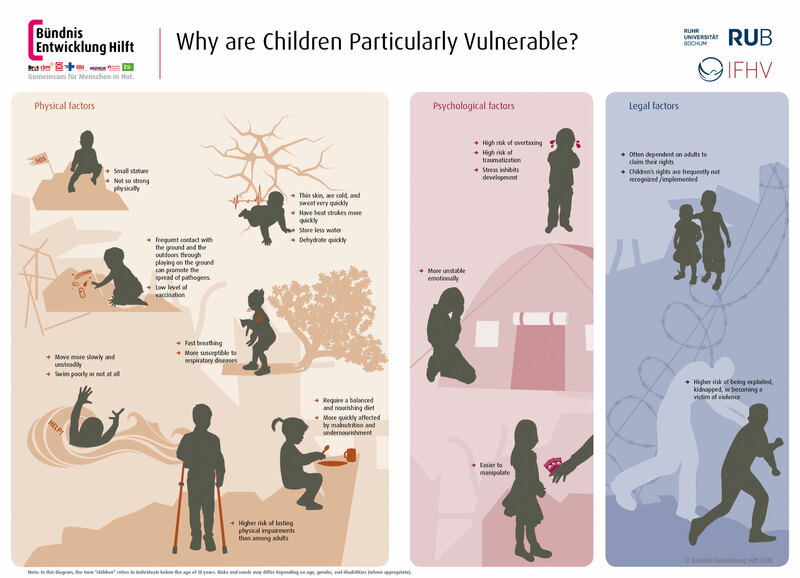 Therefore, actions plans for children should be developed in cooperation with children in areas strongly affected by extreme natural disasters. 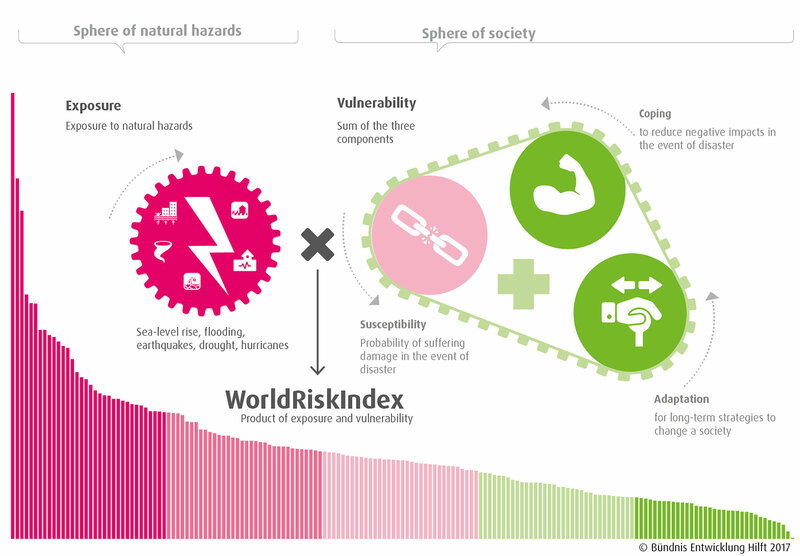 Susceptibility describes the structural characteristics and framework conditions of a society and indicates the likelihood of suffering from harm in an extreme natural event. 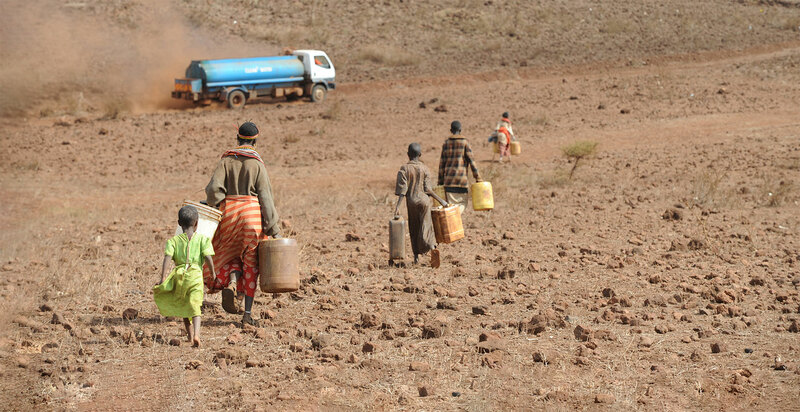 Coping comprises various abilities of societies to be able to minimize negative impacts of natural hazards and climate change through direct action and the resources available. Adaptation includes measures and strategies dealing with and attempting to address the negative impacts of natural hazards and climate change in the future. Adaptation, unlike coping, is understood as a long-term process that also includes structural changes. The concept of the WorldRiskIndex, including its modular structure, was developed together with the United Nations University’s Institute for Environment and Human Security (UNU-EHS). 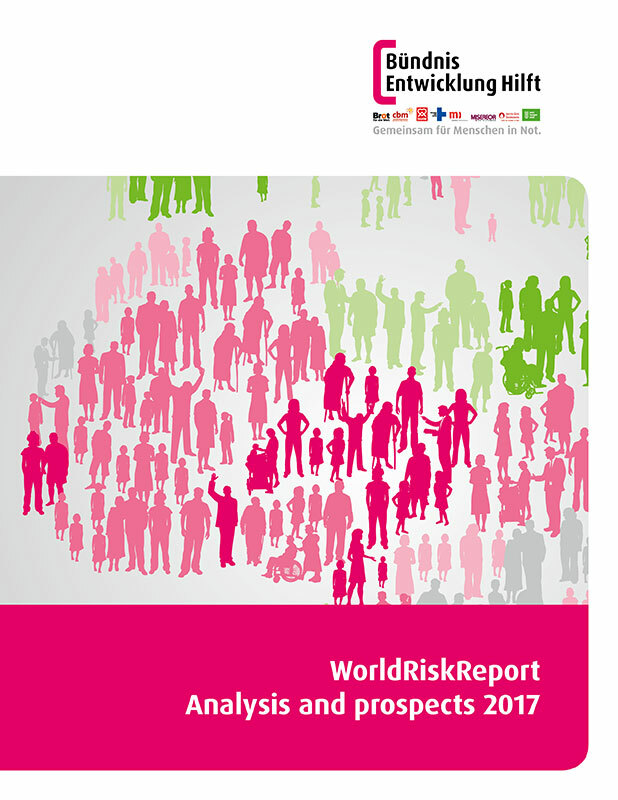 In 2017 and 2018, the WorldRiskIndex was revised on the basis of new findings. Changes have been made at the level of the indicators. 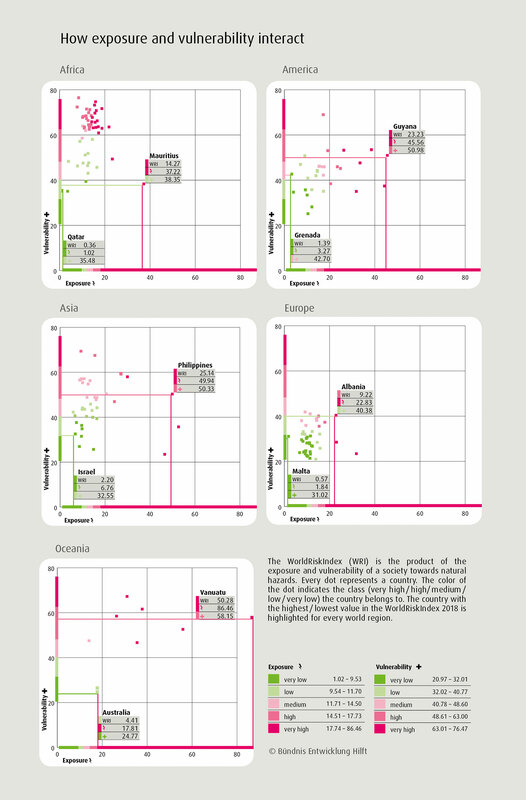 A total of 27 indicators, which are available in publicly accessible data sets, feed into the Index. 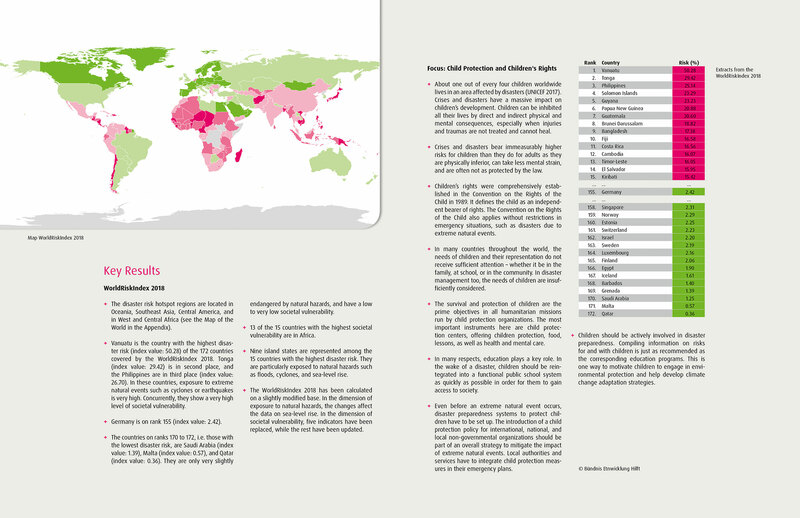 Since 2018, the Index is calculated by the Institute for International Law of Peace and Armed Conflict (IFHV) of Ruhr-University Bochum. 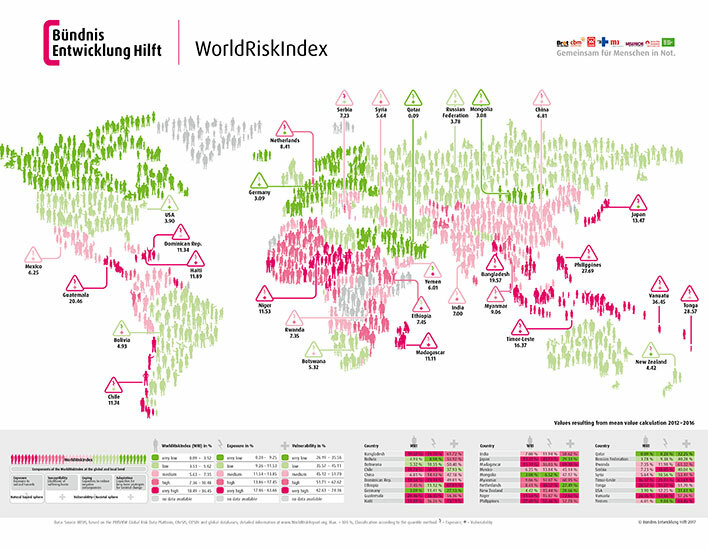 Among other things, the WorldRiskIndex serves as a guidance for decision makers and identifies fields of action for disaster risk reduction. Adapting capacities with respect to impending natural events, climate change and other challenges. 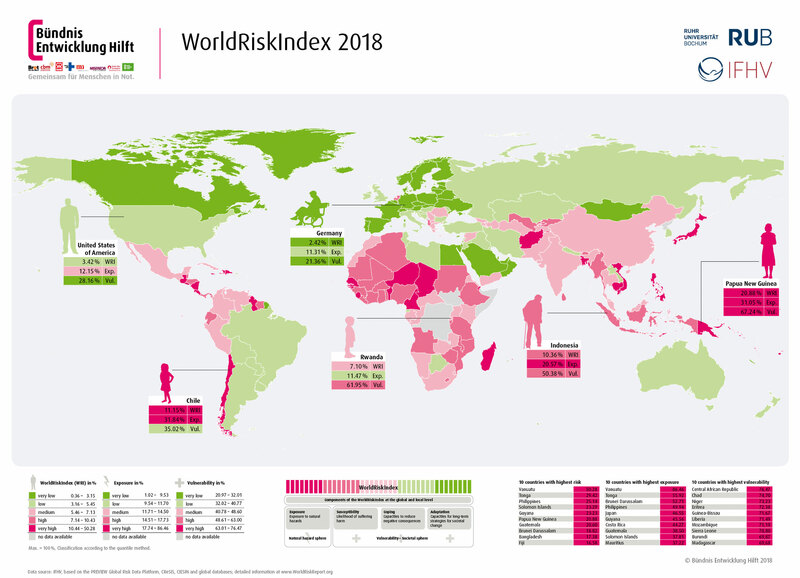 The concept of the WorldRiskIndex, including its modular structure, has been developed by both practical experts on the ground, and scientific experts located further afield. 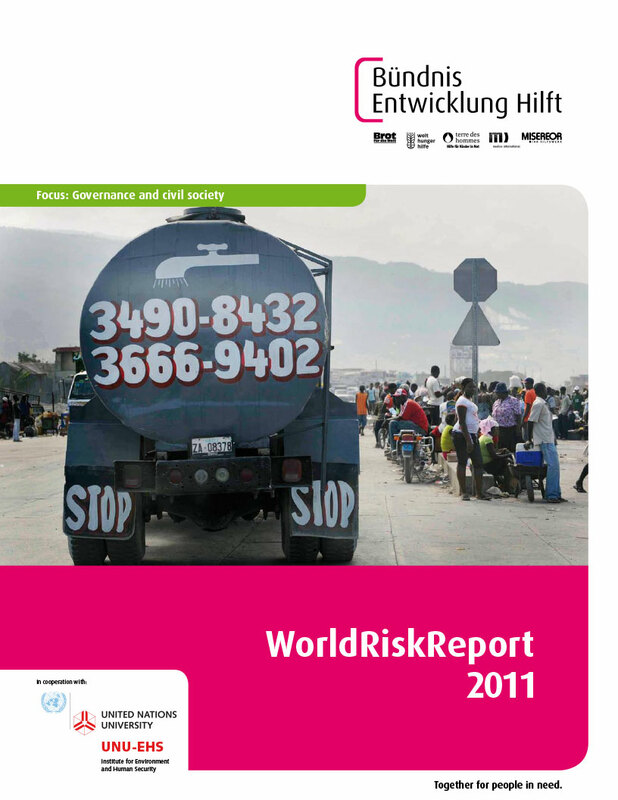 The calculation of the index, which was performed by the Institute for Environment and Human Security of the United Nations University (UNU-EHS) in the years 2011 to 2016 and commissioned by Bündnis Entwicklung Hilft, relies on datasets that are available worldwide. The world’s nation states form the reference parameter for the index. How probable is an extreme natural event and will it impact human beings? Is a society taking disaster preparedness measures against natural hazards that are expected in the future? The representation produced using the index and its four components provides answers to these questions and brings into focus both the problems and the resulting fields of action. 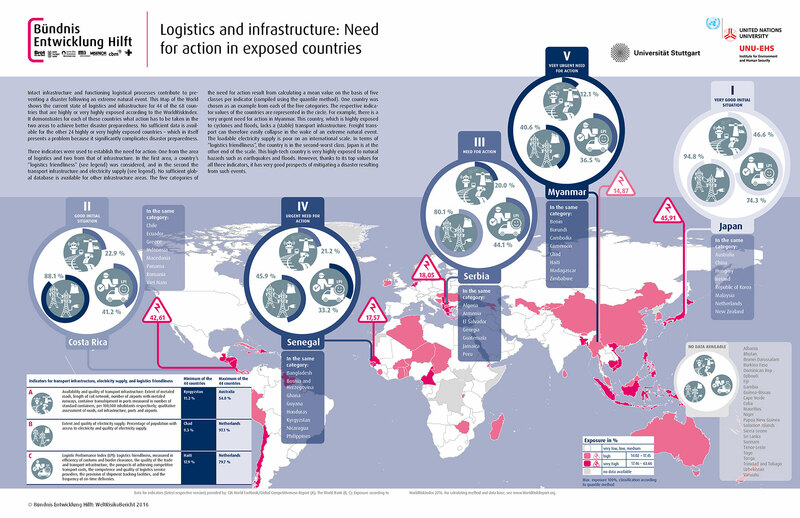 The prevailing conditions of logistics and infrastructure have a crucial impact on whether an extreme natural event leads to a disaster or not. Fragile infrastructure, such as dilapidated buildings, can have grave consequences because they pose a direct threat for the local population. Moreover, it delays the effective potential for those affected to help themselves and impedes humanitarian relief provided by the local authorities or from abroad. The difficulties that relief agencies face are mostly on the “last mile” of the logistics chain: Organizing transportation despite ruined roads or bridges, and ensuring fair distribution when, for example, there is a scarcity of water, food and shelter. 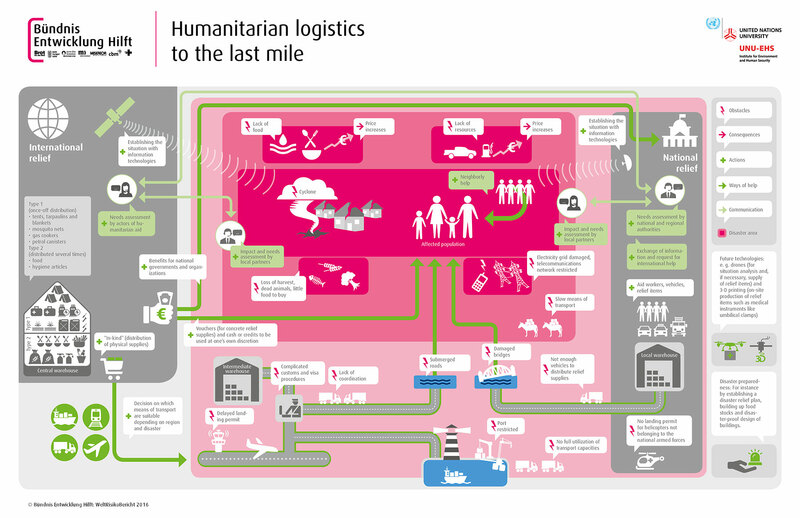 Information technology like the Internet, mobile phones or more recent technology such as drones or 3D printers, can support humanitarian logistics – that is, if they have not been impaired by a collapsed local infrastructure. But technology-based solutions aside, there still remains a host of challenges: examples include supporting self-help measures, coordinating the involved actors, making use of local resources, and the controversial issue of cooperation with the private sector and armed forces. The international community aims to end all forms of hunger and malnutrition by 2030. To achieve this goal there is still a lot of work to do. In many countries disasters, wars or political instability in the past have been the main driver of increased vulnerability and food insecurity. 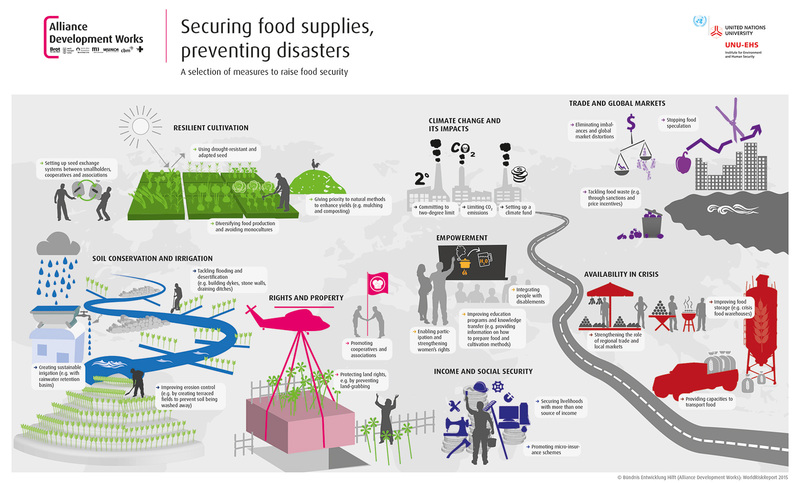 Disasters can have devastating impacts on a country’s food security – not only in the short term, but also long after they have occurred. 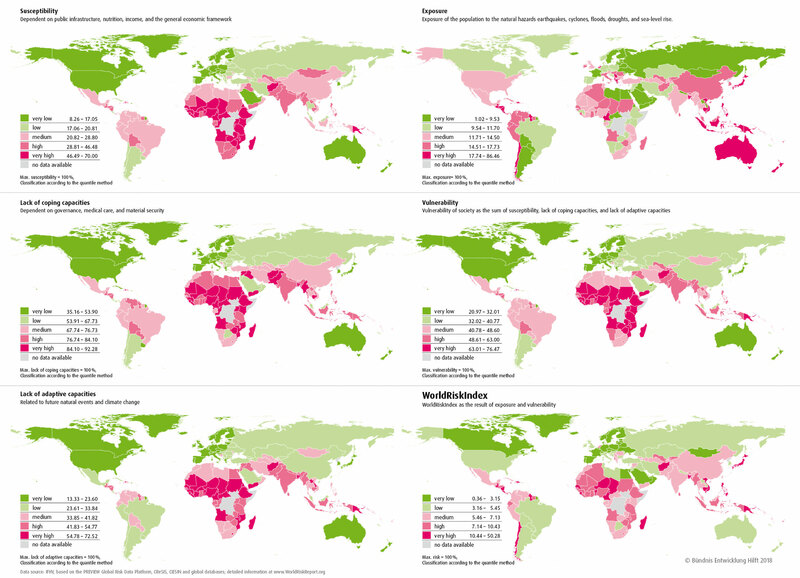 According to the World Food Programme, the agrarian sector is especially affected by extreme natural events. They destroy harvests, stocks, and transport routes, and therefore above all the livelihoods of those depending on agriculture. 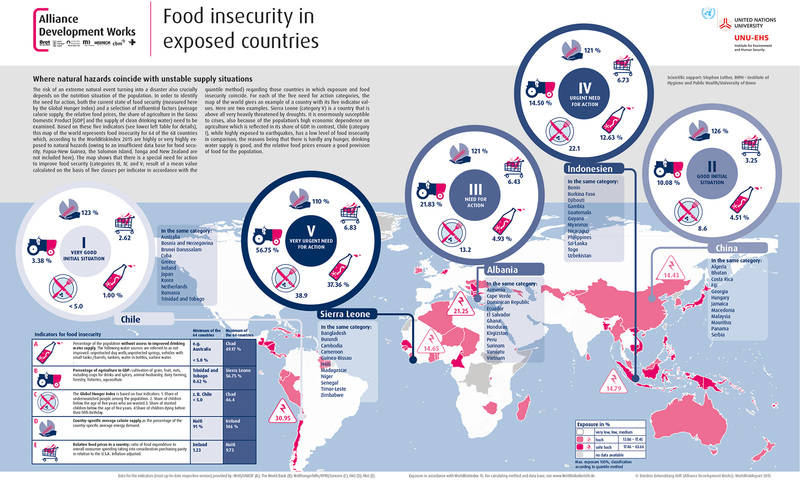 In addition the frequency and extent of these natural food security risk factors are more and more aggravated by climate change. However, the reverse is true as well. It is not unusual for extreme natural events to turn into disasters because the population affected is particularly vulnerable due to a poor food situation. 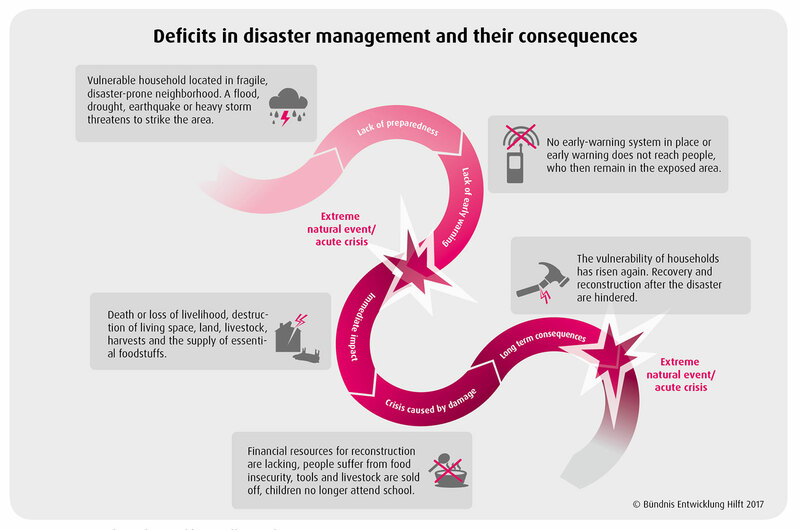 In the worst case, the combined effect of disasters and food insecurity leads to a fatal downward spiral, with the people hit slipping from one crisis into the next. 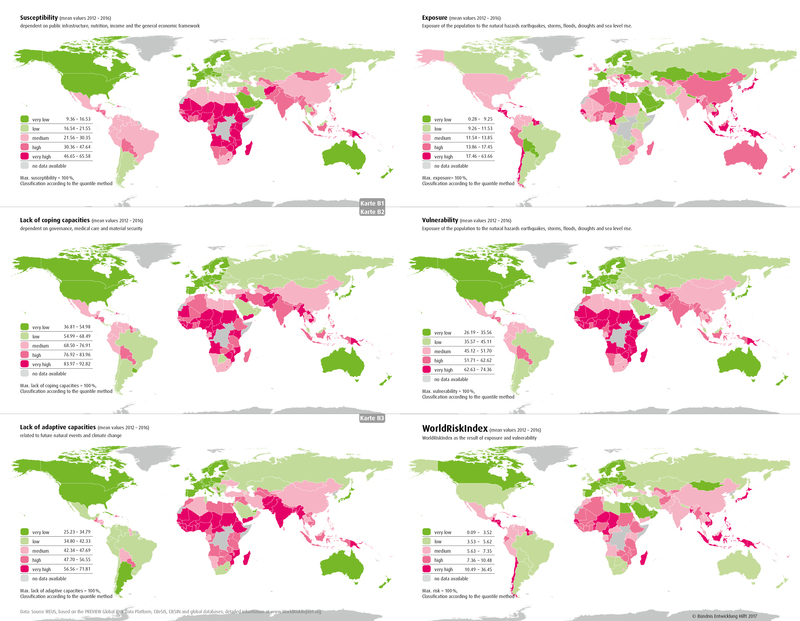 Hence, a world without hunger would mean fewer disasters. 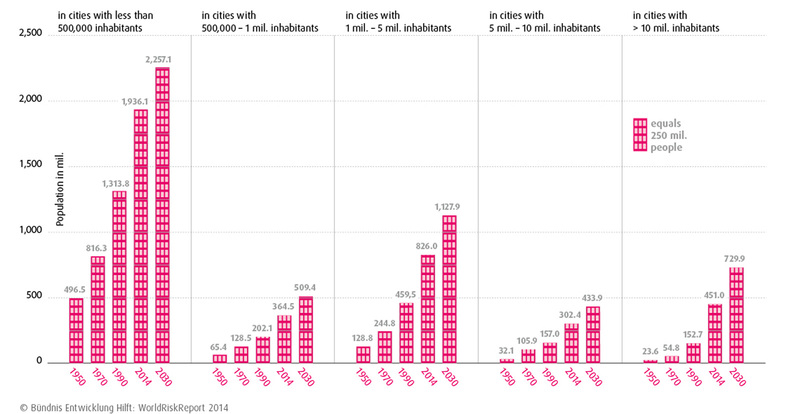 Urbanization is one of the megatrends of our times – and as such it bears a vast complexity. 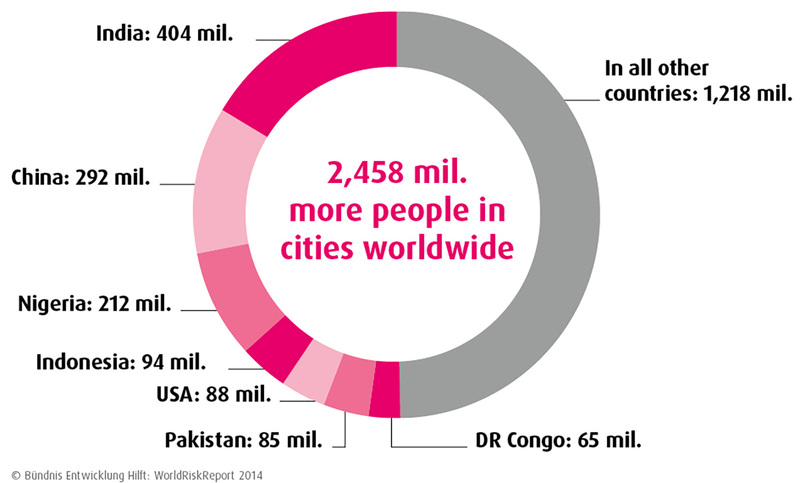 While the pull of the cities often creates problems for rural regions in the industrialized countries, massive urban population growth is posing great challenges for the metropolises in many developing countries. 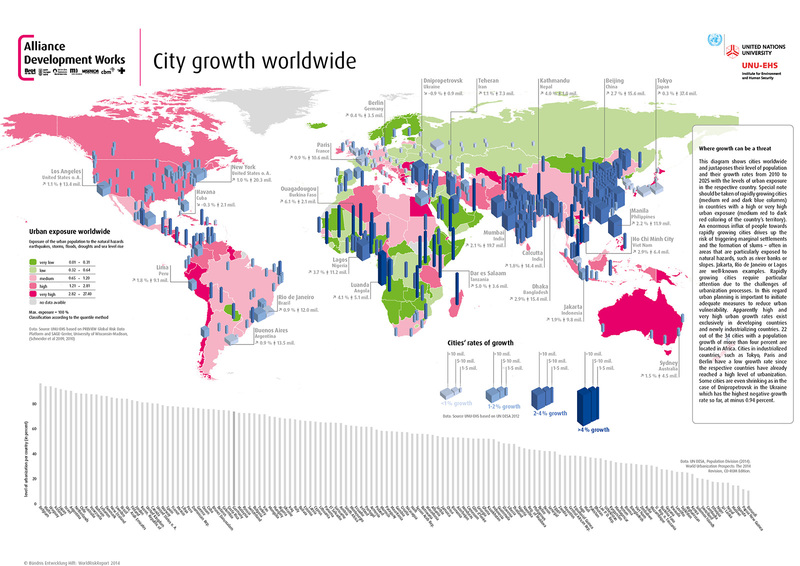 For often enough, the growth of cities exceeds the capacity of authorities to develop and maintain adequate social and physical infrastructure. One of the most pressing results is the formation of marginal settlements in which urban dwellers lack basic civil rights and often compete for ill-paid jobs and low food availability. 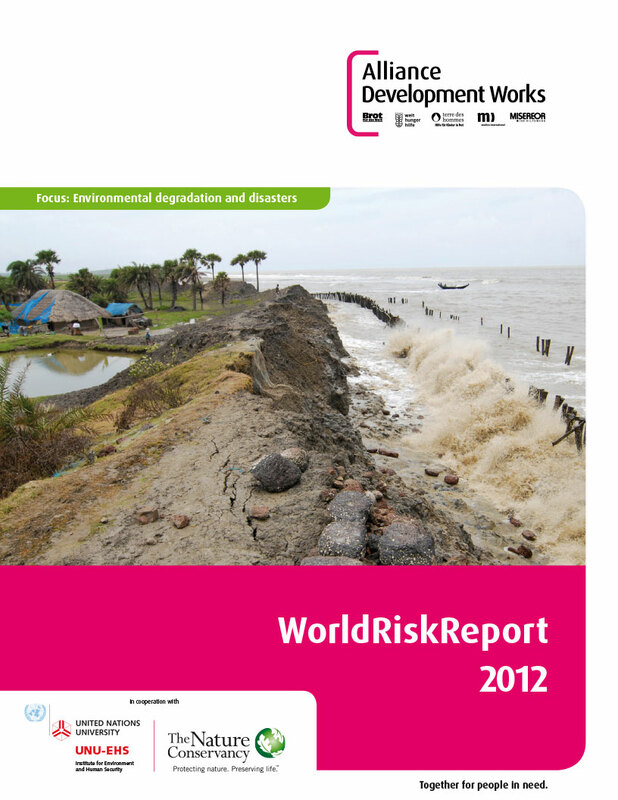 They are especially vulnerable towards natural hazards. 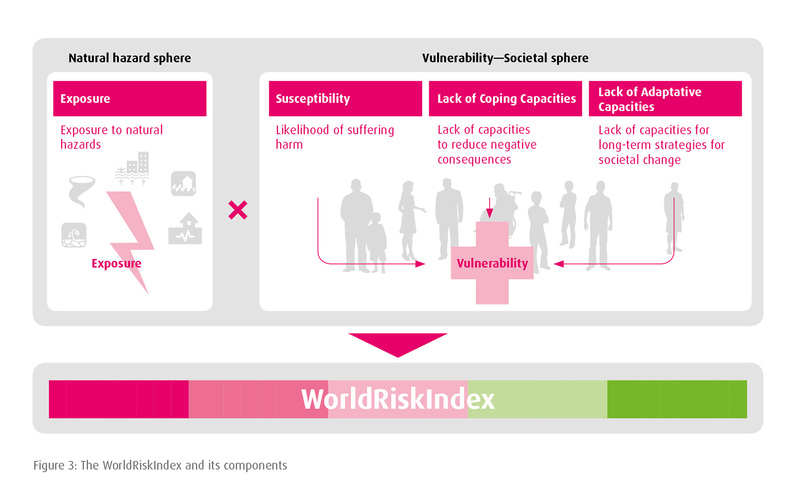 But urbanization does not produce exclusively negative effects on vulnerability, it can also create new chances for strengthening coping and adaptive mechanisms. In principle, the high density of buildings and other infrastructure in cities allows for an efficient implementation and operation of protective measures such as dyke systems or pumping stations. At the same time, cities concentrate large numbers of people, putting them into direct reach of central disaster management facilities such as ambulance services or fire brigades. 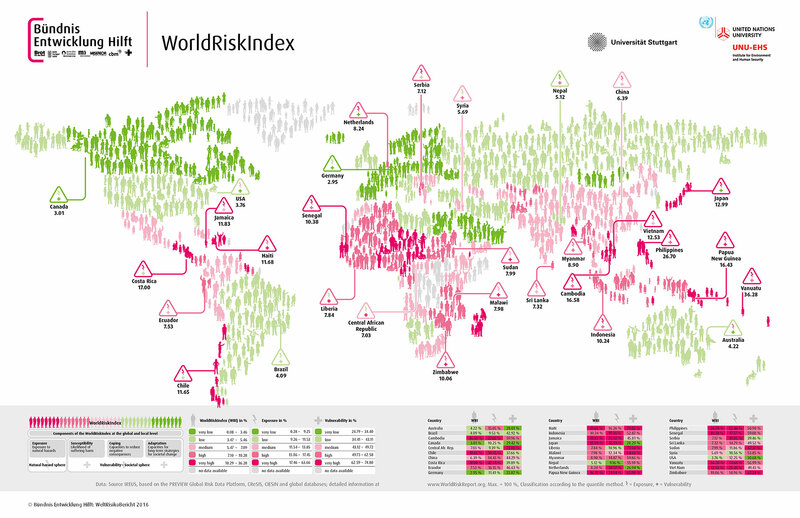 Given the thematic focus “The city as a risk area”, the WorldRiskReport 2014 separately assesses the risk for urban areas. 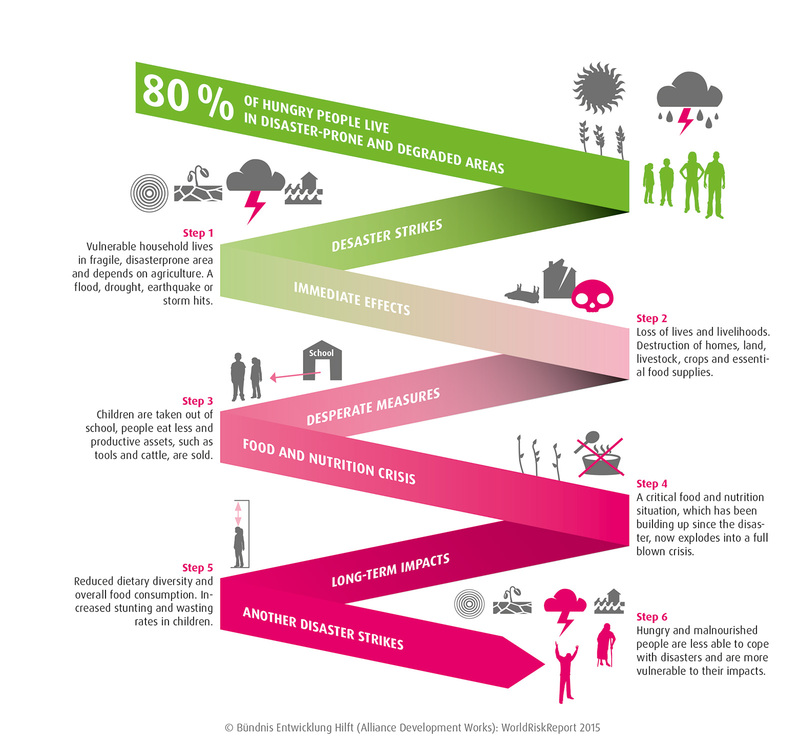 Whether it be drought, cyclone, earthquake or floods, when an extreme natural event hits a village or a town, the vulnerability of the society crucially depends on the population’s health status as well as the health care and it’s functioning in crisis and disaster situations. 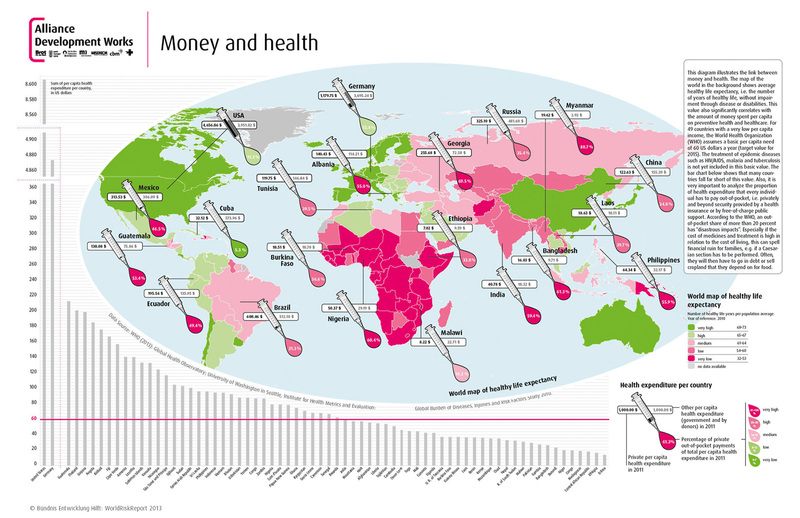 But in times of the global financial crisis, the health systems worldwide are being subjected even more strongly to economic principles. Often humans facing an already unacceptable vulnerability suffer the most from these austerity and privatization measures. However, the causal link works both ways. 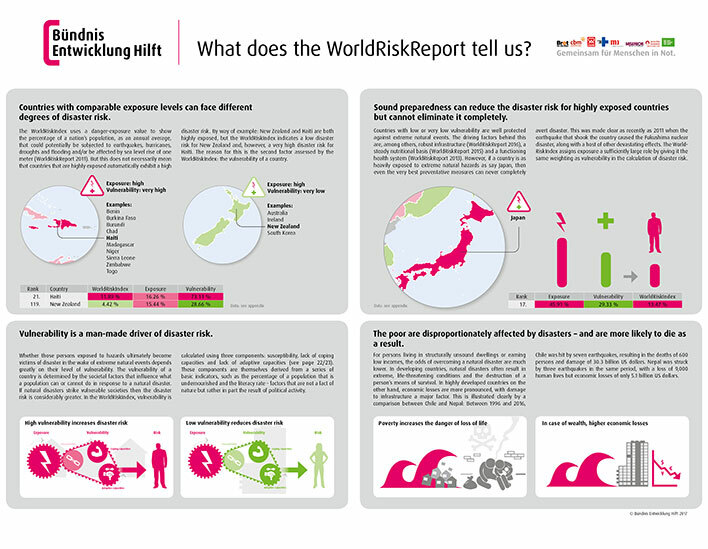 Not only do health and healthcare determine the disaster risk, but disasters have a negative impact on a society’s state of health if they overstrain or undermine the prevailing structures for the provision of care in its healthcare system. Futhermore, extreme natural events can cause direct health problems like heart and circulation problems and contribute to an increase and spread of disease carriers. A comprehensive approach to strengthening health systems and care therefore shows to be indispensable for disaster preparedness and response. 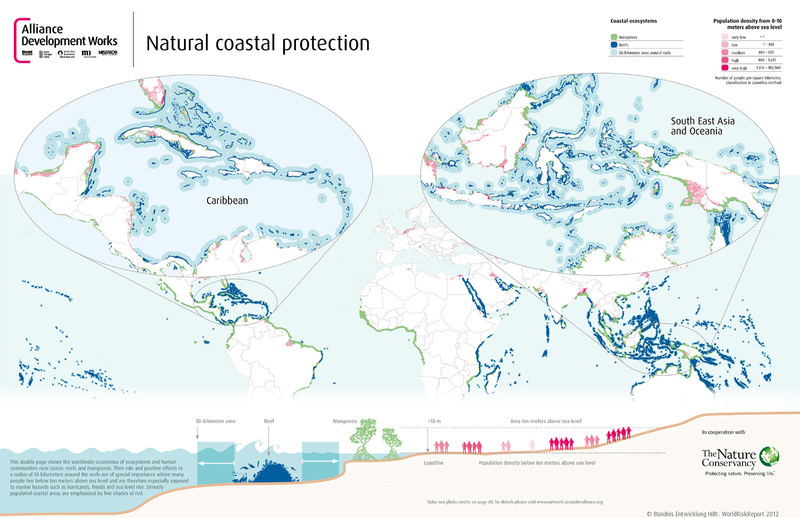 Intact ecosystems like for example forest and riparian wetlands or mangroves can significantly reduce disaster risk by reducing the susceptibility towards extreme natural events. They contribute to nutrition, income and wellbeing. In addition to food, they can also provide medicine and building materials, or they can represent new sources of income, for example via eco-based tourism. Meanwhile extreme natural events can have considerable effects on the environment and cause damage for ecosystems. 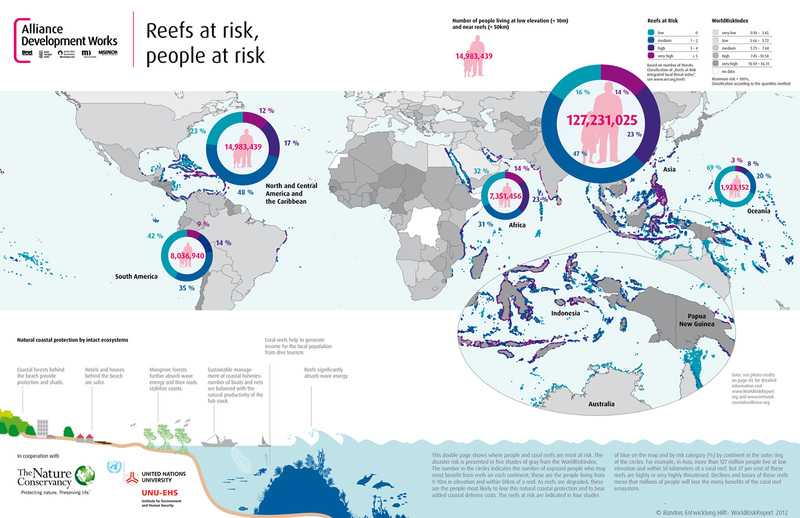 Cyclones can pull over thousands of trees and destroy coral reefs or floods can contribute to erosions and damage solum. 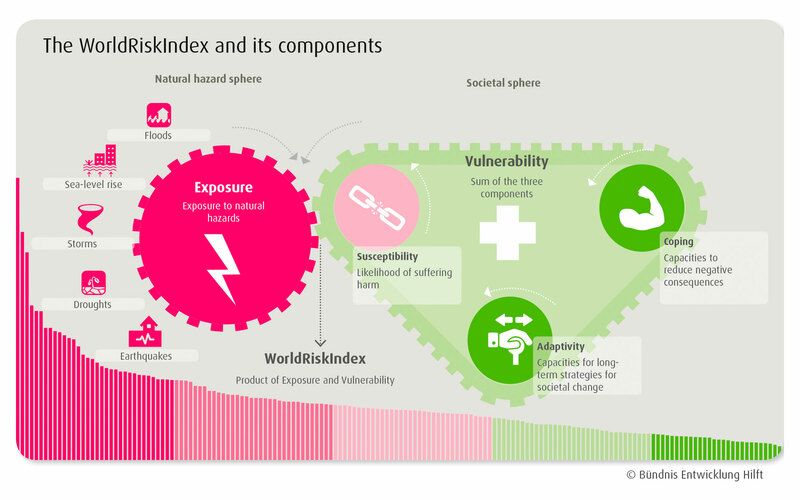 In turn, the destruction of the environment and its natural protective function in pursuit of economic interests increases the risk of disaster in the wake of extreme natural events. 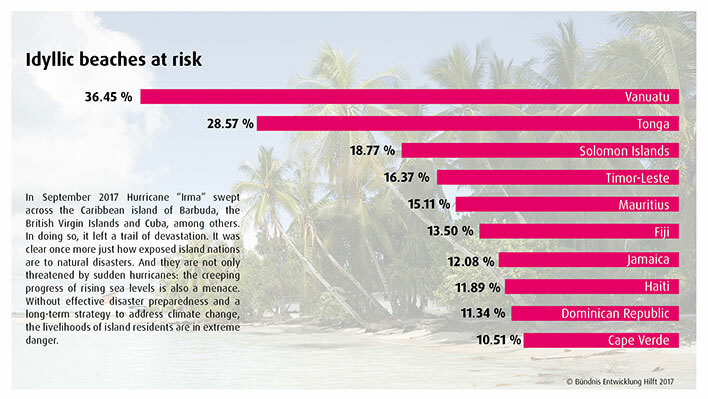 Flooded coastal villages and washed away beaches whose natural protective belt of mangroves has been chopped down are just some examples among many others. This interaction between environmental destruction and disasters still gets too little attention by politics and science. Environmental protection and a sustainable handling of the environment should be strengthened from the local to the global level and included in disaster preparedness. Humans can only influence to a limited degree, whether and with what intensity, natural events are to occur. But states can considerable influence the extent of a disaster by their governance in disaster preparedness and response. Especially states of weak governance are often not able to implement consistent strategies and measures and maintain mechanism to reduce the disaster risks. 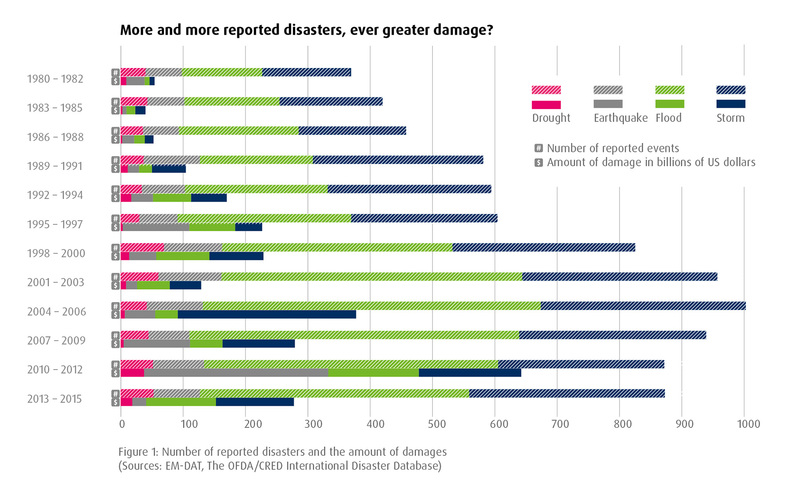 The development of disaster preparedness plans is often prevented by the low qualification or sheer non-existence of state personnel The vulnerability of the population towards extreme natural events is consequently high. 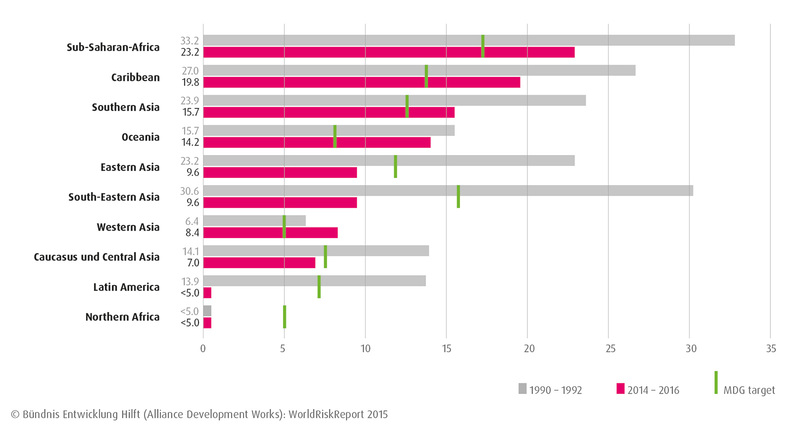 The relief aid and development work faces immense challenges, given the coincidence of weak governance and extreme natural events. 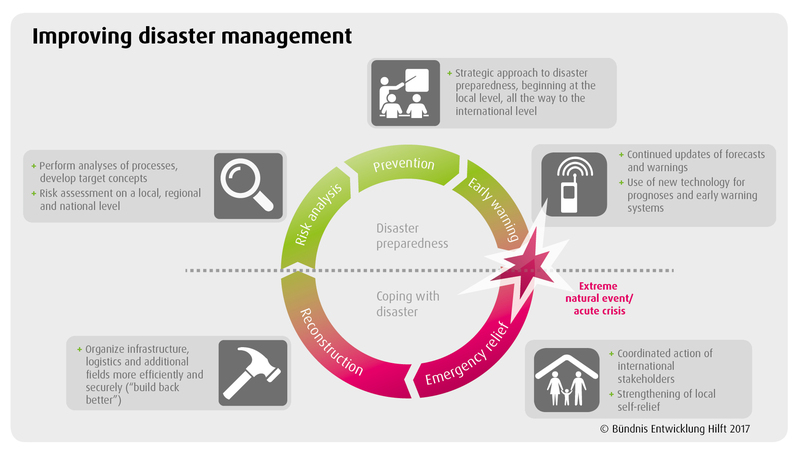 In the complex interaction between governance and disasters, civil society can play an active role by demanding responsible and effective state policies and starting initiatives for disaster risk reduction. Nevertheless it is certain that both government and local civil society play a crucial role in disaster preparedness and that each must be strengthened accordingly. 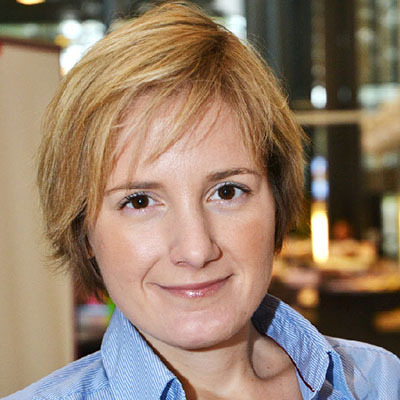 Prof. Dr. Martina Comes is working at the Centre for Integrated Emergency Management (CIEM) at the University of Agder in Kristiansand. We have to get away from the myth of the international community heroically entering the scene and getting the country going again for the poor local victims. 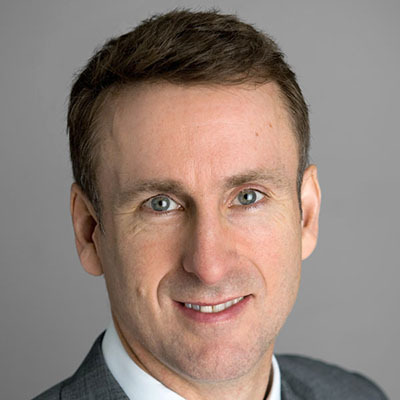 Sean Rafter is Managing Director of HELP Logistics AG, a subsidiary of the Kühne Foundations. More investment at local level in preparedness will support affectedcommunities, make economies more resilient and reduce loss of life. 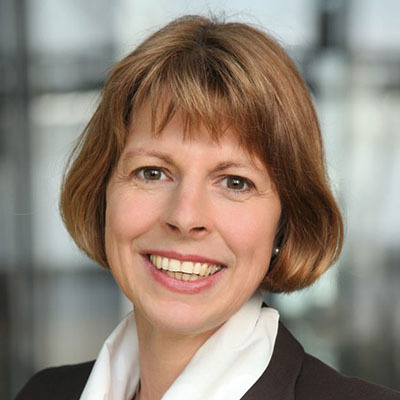 Kathrin Mohr heads the Deutsche Post DHL Group’s “GoHelp” program. Science ought to formulate tangible targets that business and the NGOs can implement together. 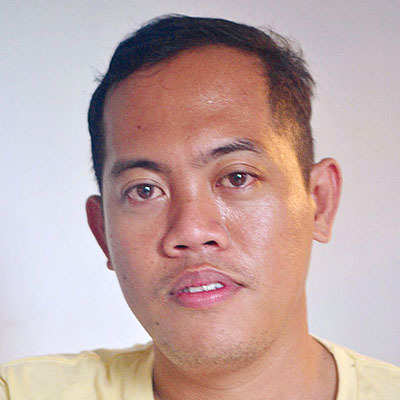 Edsel Macasil is Emergency Relief Coordinator at Kindernothilfe’s Filipino partner organization AMURT. The international community should not take over the leading role in disaster management, but should instead acknowledge the sovereignty of the local government and the capacity of its inhabitants. 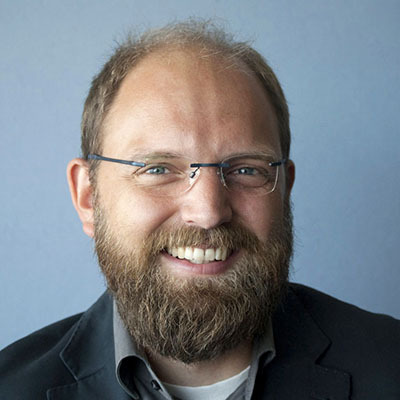 Dr. Matthias Garschagen is Head of Section, “Vulnerability Assessment, Risk Management & Adaptive Planning”, at UNU-EHS. NGOs do have to present themselves and be visible in the media. But sometimes, this results in rivalry rather than useful task-sharing and cooperation. 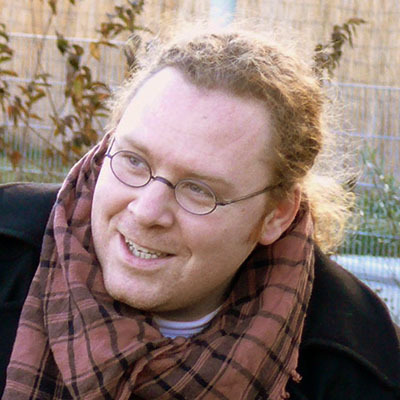 Bruno Vandemeulebroecke is Emergency Relief Coordinator and Senior Advisor Humanitarian Logistics at Bündnis' member organization Welthungerhilfe. It is very expensive to run large logistics operations, and it is partly more expensive because it is hard to find trained and qualified staff to perform the logistics duties in the most efficient way. For press enquiries, interview wishes or image material please contact our press office.